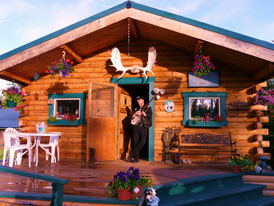 Dave and Susan live the Alaska Lifestyle. Their home is a log cabin. They garden, hunt, fish, gather berries, and enjoy an outdoor-based life. With wilderness on every side of us and wild animals wandering throughout the area, all we have to do is get out into the hills to enjoy Alaska. Our family has a favorite lake where we camp and fish for grayling. Each year we watch bald eagles raise their young in a nest near the lake as mated swans, loons, otter, and beaver go about their natural activities. In the fall we pick blueberries, cranberries and raspberries. We also harvest rose hips and currants for canning. When moose season arrives we spend up to 20 days in our high mountain camp spotting grizzlies, black bears, and dall sheep while still searching for moose. With one moose three families will have their supply of red meat for the coming year. 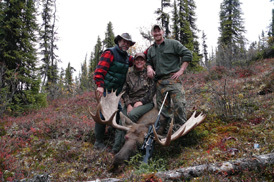 Bulls typically have antlers in excess of 50 inches in width. During the winter neighbors socialize, play cards, board games and eat lots of wild natural foods. Music and neighborhood jams are frequent events, as well as singing in our local Chapel of the North Church. Jim and Ginny Mericle and Floyd and Jeanne Seigler make up the core of the local old time music scene in Tok. They are dear friends and musical treasures. Life in Tok moves at Alaska time which is slow. This allows for time and space for reading and getting together with neighbors and friends. Money and fame are temptations Tok is free of. Those who live here are motivated by the natural wonders and the rewards that come with an honest and simple lifestyle. It is our home and we love it!